Medicine often functions by dichotomizing: ill or healthy, good or bad, normal or abnormal. In doing so, it allows those making decisions to feel that particular courses of action are correct. It is rare that things are so clear-cut, yet medical discourse commonly frames them as if they were. In fact, this is often the only option. A pertinent analogy may be the difference between passing and failing an exam. A student with a 42% isn’t much more knowledgeable than one with a 39%, yet one passes while the other is marked as a failure. An extra percentage may affect the way a student sees themselves or the way in which future employers judge their worth. Does this make them a different person? Someone who is more or less intelligent, or even more hardworking? Not necessarily. Yet, the cut off must be placed somewhere. Clearly someone who gets 98% in every exam has done better and probably tried harder than one who receives 12%, but this is an ‘obvious’ case. As outliers, they are easily definable. It is those who are ‘normal’ – those who fall in the middle – who have the most to gain or lose. In the case of physical health, these differentiations between what is normal and abnormal clearly carry their own costs, but I suggest that this argument is particularly crucial in the case of mental health – in no small part as a result of the way mental illnesses are viewed. What do you imagine when you think of depression? Public perceptions appear to be changing. More celebrities are ‘coming out’ about their own experiences with depression. It is almost fashionable – as long as one is rich and successful, and has gotten better. A study published in 2014, conducted in Australia, suggested that stigma towards those with mental illness may be divided into two main categories: ‘weak-not-sick’ and ‘dangerous/unpredictable’. That is, people with mental health problems are viewed either as malingerers or as a threat to society. Certainly, there are individuals who pose a risk to others at times and there are individuals who choose to exaggerate symptoms in order to gain material benefits, such as time off work. However, these people are the minority. These views could also be applied to physical illnesses, yet this appears to be a less common phenomenon. A recent study conducted in Italy found that 75% of those surveyed believed that people with depression should avoid talking about their illness, and 52% thought primary care physicians were too busy to treat patients with depression, presumably because they are dealing with ‘more important’ physical illnesses. In addition to social stigma, there may be costs to admitting to depression in other contexts, particularly the workplace. There is a significant economic burden due to loss of productivity as a result of depression. 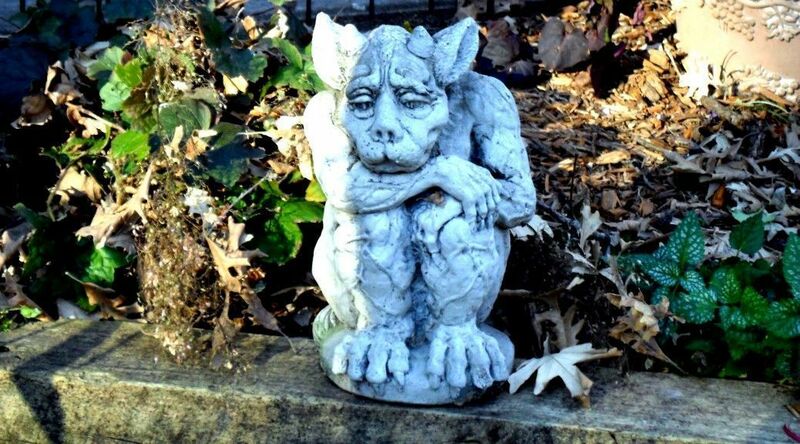 A study looking at attitudes towards depression in association with time taken off work in seven European countries showed that the attitudes of managers affected the amount of time employees took off, and whether they felt able to disclose their diagnosis. Developed by Drs. Robert L. Spitzer, Janet B.W. Williams, Kurt Kroenke and colleagues, with an educational grant from Pfizer Inc. 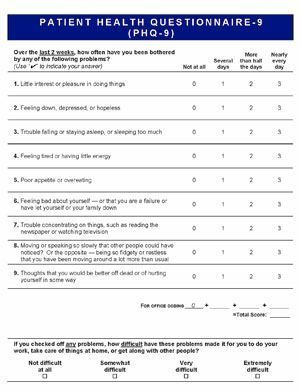 The questionnaire used to help doctors diagnose depression and grade its severity contains a range of symptoms that must be familiar to many people. For example: Over the last two weeks how often have you been bothered by feeling tired or having little energy? By feeling bad about yourself, that you are a failure, or have let yourself or your family down? Treatments, such as talking therapies or antidepressants, rather than active monitoring are advised based on criteria including symptom duration, the impact of symptoms on a patient’s life, a previous history of depression, and a lack of social support. Thus, it is immediately evident that the difference between a diagnosis of mild or moderate depression depends on some rather subjective reporting of symptoms by a patient. 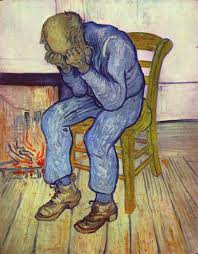 Symptoms that do not meet the threshold for depression produce significant decrements in health and the experience of them is not qualitatively different from an illness which would meet the diagnostic criteria. Further, a 2014 study found that there was an association between a belief in a continuum of symptoms in mental health and a positive attitude towards those with mental illness. So, if you notice any of the symptoms of depression in yourself or in someone close to you, it would be helpful to view these feelings not as abnormal, but in a more accepting way. Mental health is not as simple as ill or healthy. If you have lost interest in the things you normally enjoy, have negative feelings about yourself, or experience any ‘somatic’ symptoms, including a loss or gain of appetite, a change in sleep pattern, or excessive tiredness, then it may be worth seeking medical advice. It is estimated that between 8-12% of the UK population experiences depression each year. Talking therapies and antidepressants can help, and using them should not be viewed as a sign of weakness. Additionally, the Mental Health Foundation has useful information on other approaches to treatment on its website. A diagnosis of depression need not be feared or avoided. In short, symptoms of depression are very common, and there is often a fine line between the diagnosis of a depressive illness with subsequent treatment and a lack of diagnosis. People should be treated with equal sympathy and respect regardless of what side of the line they fall on.